I love avocados. They are a quick meal. I came across Rachel Ray's tip of keeping a halved avocado fresh by storing the avocado with garlic. It's rare when I don't use the whole avocado but the tip inspired me to use my private reserve avocado ink to draw an avocado. I traced out the avocado and seed first with de atratmentis document yellow. I used J Herbin Cacao de Chypre to color the seed and write out the words. The halved avocado will be left with a garlic flavor. If you don't want that, just skim off a thin layer of the avocado to get rid of the garlic taste. Here in the States, Autumn has officially began, and it's off to a beautiful start. lovely sketch and good tip! 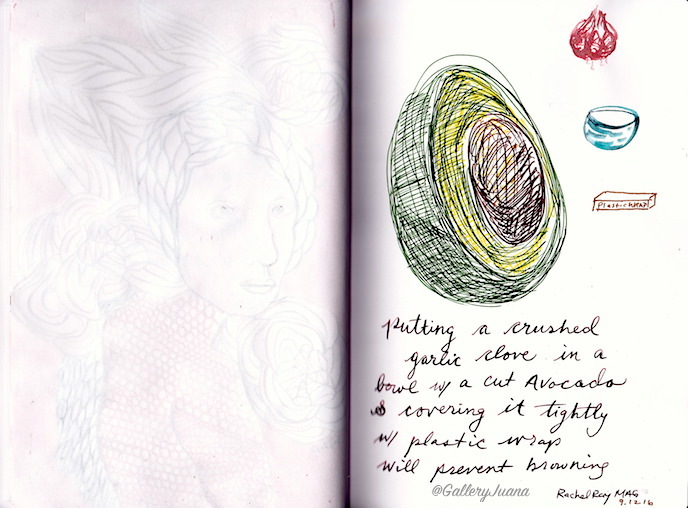 A great sketch and a handy kitchen tip. You just never know where you are going to learn something. I love playing around with inks like this. Great sketch, wonder if this tip really works. I like the crosshatching on the avocado. The addition of the cursive writing makes a really cute illustration. It's great to learn that I can prevent avocado from becoming brown with some garlic. And it's so lovely how you have illustrated this good advice! Many thanks for sharing it. lovely drawing! and thanks for the tip. everyone once in a while, i have leftover avocado. this will come in handy. Wonderful drawing ~ such great energy in that avocado! avocado ink? did you make it? our of the pit or skin? fun drawing. I love avocados and miss them from when i lived in Calif. here they are shipped and not usually very good.